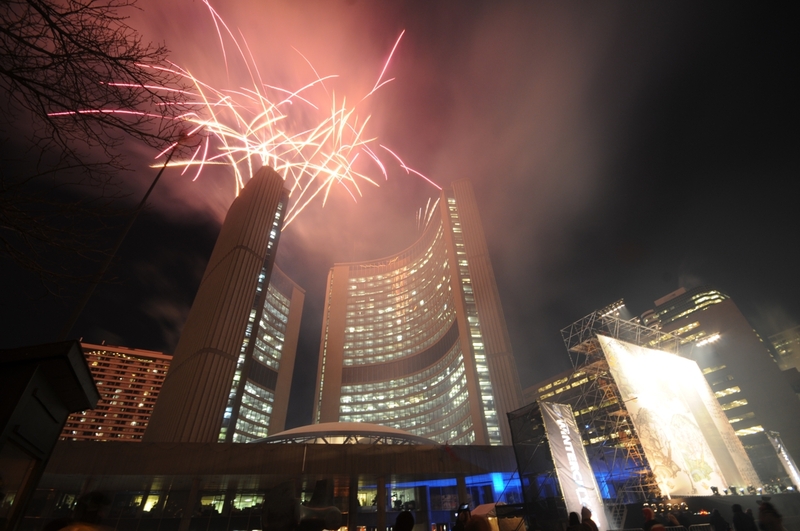 2017 is our nation's 150th birthday and Toronto will celebrate all year long - starting with the send off of 2016 on NYE Saturday, December 31. Musical group 'Walk Off The Earth' will headline the New Year's Eve celebrations at Toronto City Hall and entertainment will start at 7pm in Nathan Phillips Square. You can enjoy the night which was made for counting down with a DJ skate party sponsored by Tim Horton's, site animations and a fireworks display at midnight all presented by the City along with the Province of Ontario and the Government of Canada, the next day you can sober up with a rousing dip in Lake Ontario with the Polar Bear Dip. Photo at top by Joe Hamilton. "The evening of entertainment and fireworks will feature local and national talent while recognizing cultural and artistic diversity. Live musical performances include 2016 JUNO Awards Group of the Year, Walk Off The Earth; award-winning Mexican/Canadian artist, Boogat, Canadian/Jamaican reggae artists, Exco Levi and High Priest; and soul/pop singer and songwriter Nefe. Other site animations include a skating party sponsored by Tim Hortons with DJ Shub, formerly of A Tribe Called Red." 7 pm – Skating Party with DJ Shub sponsored by Tim Hortons | Title earning DJ and award-winning producer, formally from A Tribe Called Red takes over the skating rink at Nathan Phillips Square. 8 pm – Nefe | A rising star, this Canadian talent has the soulful power of Tracey Chapman, the uniqueness of Bruno Mars and a voice that can silence a room. 8:45 pm – Exco Levi & High Priest | Jamaican/Canadian musician Exco Levi pays tribute to the founders of reggae music through a modern twist of poetry and sound. 9:30 pm – DJ Shub & performance by techno music producer, Classic Roots. 9:45 pm – Boogat | An MC with a unique artistic approach. His popularity has earned him an ADISQ Felix Award (Quebec) for Best World Music Album and led to songs featured in U.S. films and television shows, including "Homeland." 10:55 pm – Walk Off the Earth | A multi-talented five-piece musical phenomena who won Group of the Year at the 2016 JUNO Awards. WOTE have built a massive following of dedicated fans from around the world drawn to their honest songwriting, cover interpretations and beautifully filmed videos. 11:55 pm – Countdown to 2017 and Fireworks. The last night of 2016 will also kick-off 'TO Canada with Love!' which will be our contribution to Canada's birthday. "Canada 150 is going to be an opportunity for all of us to share our pride for our city and our country. All year long we are going to celebrate with 'TO Canada with Love' events across the city beginning on New Year’s Eve," said Mayor John Tory. "The generous funding from the Province of Ontario and Government of Canada will help create free and accessible cultural events and will help us make our existing City-produced events even better for residents and visitors to enjoy." “As part of the province’s Ontario150 program, this $1.5 million investment in 'TO Canada with Love' will honour the past, present and future of our culturally diverse and exciting capital city,” said Eleanor McMahon, Ontario Minister of Tourism Culture and Sport. “From cultural festivals and fireworks to citizenship ceremonies and historical activations, everyone across the region will have a chance to create their own 150 experience, beginning with festive New Year’s Eve celebrations.” There will also be community celebrations in addition to some of the following events. • September 30, Nuit Blanche Toronto - The Canada 150 Edition"
So for now - Merry Christmas and a Happy New Year!